Genetic Hair loss or Hereditary-pattern baldness is the most common cause of hair loss. Genetic Hair loss is not really a disease, but a natural condition caused by some combination of genetics, hormone levels and the aging process. Researchers have begun to understand more about the cause of this type of hair loss. Under the influence of a form of the male hormone testosterone, the normal cycle of hair growth changes, resulting in shorter, thinner or “miniaturized” hair. Eventually, hair growth in certain parts of the scalp stops entirely, which causes the typical pattern of hair loss. Contrary to the folk wisdom that baldness is inherited from one’s mother’s family, the condition seems to depend on genes contributed by both parents. Genetic Hair loss starts with thinning of the hair and often progresses to complete hair loss on parts of the scalp. Hairs on the pillow, in the tub or on the comb are unreliable symptoms of hair loss. The average non-balding person loses 100 hairs per day, and more hair may fall out under certain circumstances, such as after childbirth or a serious illness. Male pattern baldness or androgenetic alopecia. “Andro” refers to the androgens (testosterone, dihydrotestosterone) necessary to produce male-pattern hair loss (MPHL). “Genetic” refers to the inherited gene necessary for MPHL to occur. In men who develop male pattern baldness the hair loss may begin any time after puberty when blood levels of androgens rise. The first change is usually recession in the temporal areas, which is seen in 96 percent of mature Caucasian males, including those men not destined to progress to further hair loss. In women, hair loss tends to be more widespread but better hidden. The top of the head down the middle is most commonly affected, often in a “Christmas tree” pattern. In contrast to men, the hairline along the forehead and temples usually remains normal in women. Complete loss of hair in any one place on the scalp is unusual and may suggest that a different problem is the cause, such as alopecia areata (an immune system disorder that causes bald patches), a fungus infection or one of a number of other skin conditions. Genetic Hair loss usually is diagnosed by both its pattern and a history of a similar type of hair loss affecting family members. In most people, no further tests are required. If you begin to lose hair in a hereditary pattern, you may be able to slow further hair loss by using minoxidil (Rogaine) or finasteride (Propecia). Minoxidil can be used by both men and women, while finasteride usually is used just for men. Minoxidil is a solution, now available over the counter. It is applied to the scalp twice daily. It can help to slow further hair loss in some people, and within four to eight months there may be some hair regrowth. In men a higher strength (5%) works best. In women there seems to be little difference in effect of the 2% strength and the 5% strength, and there is the risk of development of facial hair with the 5% strength. One caution: If you stop using minoxidil, you probably will lose any hair that may have been retained or restored by the medication. Finasteride is a prescription-only pill that blocks the formation of the type of testosterone that affects hair growth. Higher strengths of the same medication are used in men to stop non-cancerous (benign) growth of the prostate gland. Studies suggest that finasteride helps to prevent hair loss in up to 99% of men with hereditary-patterned baldness, and that two-thirds experience some new hair growth. As with minoxidil, any benefits from the medication are quickly lost once it is discontinued. In addition, a small number of men develop difficulty with sexual function. Finasteride does not appear to prevent hair loss in women. It also may cause birth defects, and should not be used by any woman who could possibly get pregnant. However, other types of hormonal treatment, such as certain types of birth control pills, may help the small number of women with hair loss that have elevated levels of male hormones. In some people, hair loss may be caused by certain hair treatments (straightening, coloring), hairstyles (tight braids) or hair pulling. These do not cause hereditary-pattern baldness, but they may contribute to hair loss and should be discontinued. A variety of other creams, oils, lotions and herbal remedies for hair loss are regularly advertised. However, only minoxidil and finasteride have been proven useful. Minoxidil and finasteride may prevent hair loss and promote new hair growth. This effect, however, is quite unpredictable from one person to the next. 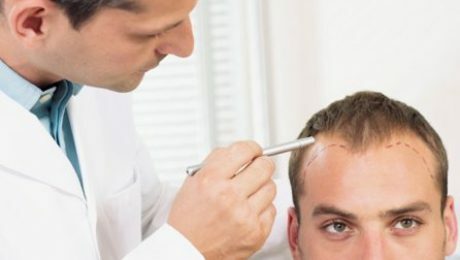 Scalp reduction – Strips of bald skin are removed surgically to decrease the size of a bald spot. Hair flaps – A strip of skin with good hair growth can be moved from a less cosmetically important area to a more important one. Hair transplants – Tiny plugs of skin containing from one to 15 hairs are moved from the back or side of the scalp to a bald area. The newer “micrografts,” which contain very few hairs, yield the best results, but are more expensive and time consuming than older types of transplants. Up to 700 individual grafts may be necessary to complete a treatment. 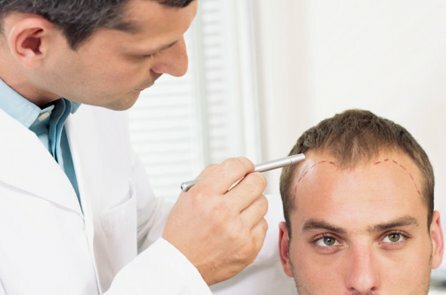 It may take up to two years to see the full benefit of hair replacement surgery. 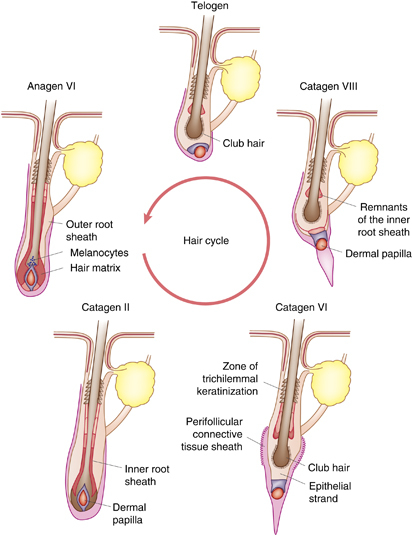 Hair grows originate from the follicle, root,and underneath the skin. The hair is ‘fed’ by blood vessels at the base of the follicle, which give it the nourishment it needs to grow. 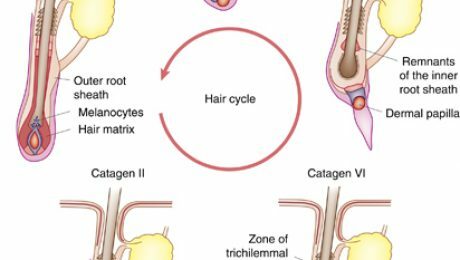 Between starting to grow and falling out years later, each hair passes through four stages: anagen, catagen, telogen and exogen. Every hair is at a different stage of the growth cycle. 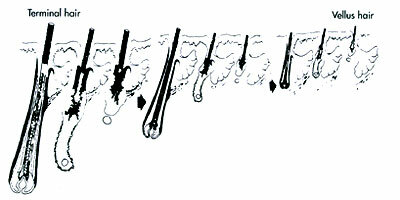 The above figure shows miniaturization of the hair follicle in pattern hair loss. Hair grows for shorter periods of time and becomes smaller, finer, and lighter as it approaches the vellus stage. A common family predisposition involves natural, age-related hormonal changes that can trigger hair loss. This is caused by the conversion oftestosteroneinto the toxin Dihydrotestosterone (DHT) and can be inherited from either your mother or your father. What you eat can play a significant role in hair thinning. A high consumption of animal fats, rapid weight loss and liquidproteindiets can result in a lack of amino acids,biotin,iron,proteinandzinc— all of which are essential for healthy-looking hair. Several underlying health issues can cause hair thinning, including a malfunctioning of the hormone-producingthyroidgland and the natural hormonal changes women experience after pregnancy and during the menopause. Air and water pollutants,chlorine, metals and minerals may be left on the scalp and hair as we wash with water every day, contributing to thinning. Pollutants such as pseudo-estrogens and toxins from within our bodies are also a factor. The causes of Alopecia Areata are not fully understood. Alopecia Areata is considered to be an auto-immune condition in which the immune system of the body (which protects the body from bacteria, viruses, allergens, etc.) mistakenly attacks the hair follicles and destroys them. This leads to hair loss in the affected area. This abnormal behavior of the immune system is understood to be guided, influenced and triggered by multiple factors. The exact hair loss causes, why hair follicles undergo this kind of destruction, is not known but a genetic component to this is suspected. Family history of Alopecia Areata or any of the other auto-immune diseases (such as hypothyroid, diabetes, cancer, ulcerative colitis, rheumatoid arthritis, etc.) is often seen in many cases, suggesting a role of genetic element. In addition to the genetic predisposition, certain triggering factors may bring on the onset of this condition. Prolonged underlying stress often predisposes some patients to develop auto-immune process leading to Alopecia Areata. However, stress may not be the cause in every case. Alopecia Areata treatment has to take into account the underlying causes. Trichotillomania is the name given to habitual, compulsive plucking of hair from the scalp or other hair-bearing areas of the body. Over time, continual plucking of scalp hair will result in a hairless area-a bald spot. Long-term trichotillomania can result in permanent damage to scalp skin and to scarring alopecia. It is not known whether trichotillomania should be classified as a habit or as obsessive-compulsive behavior. In its mildest form, trichotillomania is a habitual plucking of hair while a person reads or watches television. In its more severe forms, trichotillomania has a ritualistic pattern and the hair-plucking may be conducted in front of a mirror. The person with trichotillomania often has guilt feelings about his or her “odd” behavior and will attempt to conceal it. Hairloss Causes: Physiologic stress is the cause of telogen effluvium. These inciting factors can be organized into several categories, noted below. In humans, however, the role these effects play in hair loss has not yet been determined.